Dirk said: "I would like to recommend a new travelbookstore in Antwerp, Belgium. 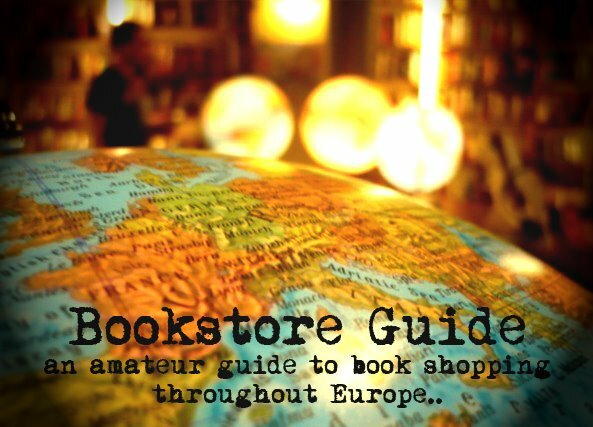 An international range of travelbooks in Dutch, English, French and German. Lots of maps for walking and cycling. 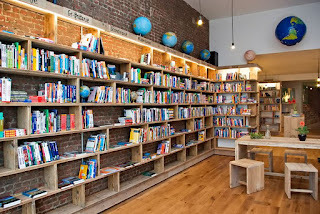 In a cosy atmosphere with hard wood shelves and chairs where you can talk to other people with a cup of coffee..."
Alta Via is an independent travel bookstore with an ecological vision - it offers a wide range of guidebooks, maps and all sorts of things one might possibly need during a trip. These come in a variety of languages: Dutch, French, German and, of course, English. Here you can find publishers such as the classics Lonely Planet, Time Out, Eyewitness, Frommer but also the less known ones such as Moon, Jonglez, Cadogan, and many many more. And the ecological part? Alta Via donates 5% of their earnings to CompenCO2, a non-profit environmental organization. Furthermore, the shop is decorated with recycled wood scaffolding, painted with ecological paint, does not give away any plastic bags and, needless to add, uses energy efficient appliances and light bulbs. The owners, reportedly, always take the bus or bike to get to work. The good people of Alta Via have based their bookstore on the principles of contemporary philosopher Alain de Botton, which he explored in his book The Art of Travel. De Botton argues that people travel in order to find out "why", to explore their own curiosity - and Alta Via can certainly help you in this exploration. The owners of Alta Via are definitely no newbies. Xavier has been a cyclist for years and he even cycled several continents on his bike, while Dirk's passion towards flora and fauna has led him to his trekking adventures in Europe. Therefore, be certain that, if you ever wander into this store, you won't leave disappointed. 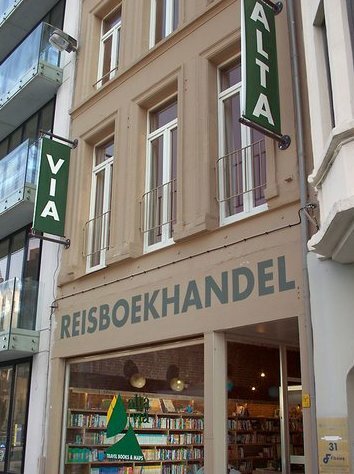 They take pride in their store because it's not only a place to get quality resources for your travels but also a place where you can meet different people, exchange ideas and travel experience (even over a cup of coffee, Oxfam fair trade organic, of course). Alta Via is indeed a bookstore with a consciousness. Also, check out the bookstore's promo on YouTube.